iPhone 3G signal faults are becoming a more common issue on the older iPhone's. If your iPhone has no signal bars or displays NO SERVICE in the top status bar it is usually a hardware fault and not a network issue, if you experience any of these symptoms we can repair the unit for you. We can also resolve GPS faults you may have with your device if you have problems getting a GPS signal lock in any apps we can repair with this service. 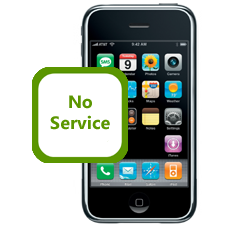 Allow our expert technicians to fix iPhone 3G GSM reception issues, loss of or erratic GPS signal faults you have! * Our normal repair turnaround times are 3-5 working days. We always aim to complete repairs as fast as possible. This is an in-house Apple iPhone 3G repair service, when ordering this service you are required to ship your iPhone into our repair centre for works to be undertaken.